The obvious advantage to selling online is that you don’t need a shop. Well, not a bricks and mortar one anyway. Although that’s a neat way to sidestep a whole heap of potential problems, it doesn’t mean you’re completely in the clear. Your shop might be virtual, but that doesn’t mean your responsibilities are. You still have risks and liabilities. But what are those risks? What can you do to reduce them? What sort of insurance covers them? How do you decide what insurance you need? Where do you go to get it? 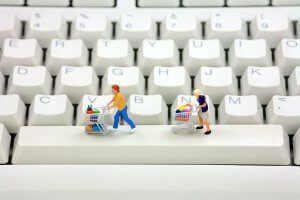 Here’s all you need to know about online retailers’ insurance. Product liability insurance covers property damage and bodily injury caused by the things you sell. If something you’ve sold is defective, and it damages a customer’s property or injures someone, you could be liable. Let’s say you sell electrical goods. A faulty plug on a clock radio sparks an electrical fire in a customer’s home. Or maybe you make and sell jewellery. A customer alleges an antique bracelet they bought from you caused an allergic reaction. In both cases, you’ve supplied the things at fault and the buck stops with you. Even if you don’t make the things you sell, tracing the manufacturer who did can be tricky. More so if they’ve gone out of business. In those cases, as you’re the last link in the chain, it’s likely you’ll be held responsible. Product liability insurance helps pay for the damages you’re liable for, even if you don’t think you are. Public liability insurance covers property damage and bodily injury caused by your business. But, you can have suppliers visit you. And couriers. You might deliver things to people every now and then, too. All these things increase the chances of someone getting hurt or something getting damaged. In simple terms, if your business is in contact with members of the public, wherever and however that might be, you need public liability insurance. Property insurance covers your stock and the things you need to run your business, against loss, theft and accidental damage. Having thousands of pounds worth of stock sitting around is fine – until something happens to it. Suddenly being without anything to sell could cripple your business. It won’t be cheap to replace, either. Likewise, how will you keep track of and fulfil orders if your computer’s stolen? It’s best not to rely on your home insurance for help, either. Many standard home insurance policies exclude cover for items used for, or related to, your business. Online retailers’ property insurance is designed specifically for business, whether it’s home-based or not. Employers’ liability insurance covers claims against you if staff get injured or ill while working for you, and it’s your business’s fault. For example, someone puts their back out lifting a box of your stock. If you haven’t given them proper training, they could (and probably will) claim against you for damages. If you employ someone – even just one person – the law says you need employers’ liability insurance. Importantly, that’s the case even if that person is part-time, a temp, a volunteer, on work experience, or just an extra pair of hands helping out. There are exceptions to this, however, and your best bet is to read the HSE’s guide for employers. Business interruption insurance pays to help keep your business running if an unexpected event or circumstance does its best to scupper it. Out-and-out catastrophes are, thankfully, pretty rare. The likelihood of you not being to trade due to, say, an asteroid strike is slim to put it mildly. But, more mundane problems happen every day. Imagine some clumsy workmen chopping through a data cable and knocking out your internet for a week. That’s not going to help your bottom line. What if your garage floods, ruining your stock. Your property insurance will pay to replace what’s damaged but how long will that take? How do you make any money in the meantime? Business interruption insurance covers lost profit for the time you’re out of action. Personal accident insurance protects your business if you or an employee are killed or permanently injured in an accident. No one wants to dwell on the ultimate worst-case scenario but you need to at least consider what’ll happen if you’re out of action. If you can’t physically do what you need to run your business, this insurance helps. It covers things like recruitment or training costs if you need to get in extra pairs of hands, and picks up the tab for your medical expenses too. So there we go. Plenty to think about. Even if your online shop isn’t much more than a part-time sideline, it’s easy to run into problems. Expensive problems, too. Insurance might not be top of your shopping list but it’s definitely something you won’t regret buying. If you’d like to see how little it can cost to protect your business, click here to find out more and get a quote. When you’re ready to buy, everything can be sorted out online (where else? ).